Hey, DJ - I've been listening this evening since Eleanor Rigby to Moby's Extreme Ways to Shawn Mullens and Sheryl Crow, to a pair of cellos who Smell Like Teen Spirit, and now The Decemberists' Severed. I'm in bliss. If you get a chance, please let me know more about your schedule, and I'll be tuning in! The joy this evening inspired me to send a contribution and make my first ever comment. Many thanks! Damn good. This is the first song they have released that I really dig since The Hazards of Love album (which is awesome all the way through). Some one has been listening to a lot of Alt-J. Look again at the lyrics, as you could interpret them to mean the exact opposite too. Depends on your political point of view. Please explain yourself. My gut reaction is that there is no substance to your words, but maybe I misunderstand you. Also, as far as meaning goes, there is a context of the rest of the album to consider, and if you still don't get it, you can read an interview with the writer. The drums on that are not half bad, are they? Thou shalt move thy hips!! This is Debbie Downers' theme song. what on earth is he singing about? Why not throw in the old crane wife or mariner's revenge for a change? Previous comments notwithstanding, I saw them last Saturday and it was a great show. Unfortunately they were sandwiched between Lucero and Jason Isbell (Lucero is the best live band on the planet BTW) so it was a strange lineup, but very fun. Decemberists put on a good show, and no I never watched Barney lol. Great song. Oh and OT but if you get a chance to see Isbell, go and do. Phenomenal as well. "This is a test of 'smart quotes' as entered via the web form." To the folks claiming The Decemberists are a great band live; were your previous live experiences comprised of acts where the musicians wore brightly colored clothes, sang about letters and numbers, dinosaurs and/or the days of the week? Did you accompany these shows with a small child? Were you miffed because they served juice boxes instead of craft brews? And then were you ecstatic to attend a big kid rock show where The Decemberists were the headliners? The only reason this song is better than all their others is because it ISN'T a sea shanty! Gawd...this is even worse than all the previous Decemberist songs. No other band on RP makes me race as quickly to the PSD button! I hear you. I hit PSD asap when they come one BUT I'm liking this one. Quite the style shift from their previous work. I think I like it, but would like to hear more from the album. Yeah, interesting stuff. I'll wait a bit before rating this but I'm liking it tonight. How hip is this Decemberist tune. Transcends so many eras of great music. Well selected. But I am seeing them live next month!!!! 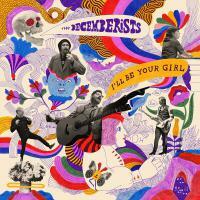 I like the Decemberists, but this... well... this just might be their Kid A. Such a great live act. Have fun! As of now: 11 times in the last 30 days = ~ 1 every three days. Agree!!! I started turning it off when I hear it on the radio now since it's played way to much there too. It's a catchy tune, but is being KILLED by overplay! Been hearing this rotate a lot through Bill's playlist. Must mean it's a new album! Looking forward to this bold sound coming in March. The guitar sounds a bit Ricky Wilson-ish (the one from the B-52s). Ha ha ha is anyone else hearing Dirty Deeds Done Dirt Cheap for second there? BTW, that is not a bad thing and this is excellent. This track has me excited to hear the rest of the album! At first I thought it was a cover of Peter Schilling. Then upon hearing Colin Meloy's voice didn't know what to think. Definitely an interesting evolution for the band. Now to find out if the album is a concept/prog album or not. Thank god it doesn't sound like an R.E.M. production. I like this. like most new Decembrists songs, I hated it the first time. Now on the third time hearing and I'm into it! got my tickets for DPAC! Blimey, this is a change of direction. I like it a lot, but then I am thoroughly enjoying a lot of their work lately. Talented folks, I feel. edit. I'm looking forward to seeing them here in November.